In a mystical version of feudal-era Japan, modern-day schoolgirl Kagome and half-demon Inuyasha are drawn together across time to protect a land ravaged by demons! In these four feature films, our heroes take on new challenges and strange foes. With their crew of demon-slaying friends, Kagome and Inuyasha face the adventures of their lives! This limited edition include all four full-length movie CD sountracks and premium wooden box packaging. 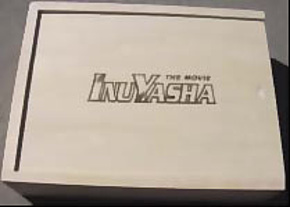 DVD Features: Clean opening and ending.